We are so excited to be able to bring Lisa M. Hendey to speak at the 2018 Columbus Catholic Women’s Conference. Lisa is an accomplished writer and speaker and a wonderful example of “being brave” with the gifts God has given her. Lisa’s work has been truly an inspiration to us and many other Catholic women around the world. Because of this, we can’t wait to share her with the women attending and listening to the conference. It is very possible many of you are already familiar with Lisa M. Hendey’s work (see full bio below), but if not, we’ve invited her to answer some questions about herself. Lisa, welcome! Please tell us a little about yourself. Thank you for your warm welcome! After hearing such wonderful things about the Columbus Catholic Women’s Conference, it’s truly an honor to be a part of your gathering this year. I’m a Catholic wife, mother and now mother-in-law living now in Los Angeles, California. My husband Greg and I met as students at the University of Notre Dame and married during his first year of medical school. It’s been a great joy to live our lives together for the past thirty-two years. I’m blessed to be the eldest of five in a close-knit family. As a child and throughout my upbringing, my parents gave us an amazing gift by placing belief at the heart of our family life. In 2000, as a personal longing to better know my Catholic faith, I founded a little website called CatholicMom.com. What began as a hobby has blossomed into a beautiful apostolate which actually became a part of Holy Cross Family Ministries last summer. The work we began now lives under the umbrella of a worldwide ministry begun by Venerable Father Patrick Peyton, C.S.C. I spend my days caring for our new little home in LA, writing, speaking, enjoying the beach and worshiping in our new Archdiocese. Lisa, you call yourself a Missionary Disciple. What does it mean to be a Missionary Disciple? Last summer, I had the great blessing of attending the Convocation of Catholic Leaders assembled by the United States Conference of Catholic Bishops. Amidst those beautiful days of prayer and education, I learned more about living life with a deliberate purpose to wake up each day longing to follow Jesus Christ and to share my love for him with others. To be honest, it relit a flame in my heart to understand how I, just one little wife and mom and woman, could possibly walk in the footsteps of so many who have evangelized and taught the faith. But I understand that each of us, in our own “Little Way”, by merit of our baptism and as members of Domestic Churches, have this same blessed calling. Is it easy? No. Do I fall short? Yes, most days. But every day, my first “Yes” is to give God my heart as I embrace this role with “the joy of the gospel”. I’m learning to try to not overthink the calling, and just to try be open to the opportunities that the Holy Spirit provides along my everyday path. I think if we women truly pay attention, we will discover that the chance to walk as Missionary Disciple happens every day, right where we are. Our theme this year is based on Pope Francis’ words “Ask Jesus what he wants from you and be brave!” Looking back at all you’ve done from the start of CatholicMom.com till now, it certainly seems you have embraced this idea. How do you see those words of Pope Francis playing out in all that you’ve been a part of since that first day you decided to start CatholicMom.com? I have to laugh a little when I reflect on the amazing sense of humor that Jesus has when he gifted me, a French major and suburban housewife with zero technical abilities, with the responsibility of starting and growing CatholicMom.com. But it’s clear to me that what we do has always thrived because it was not done in isolation. From our very beginning, the services we provided were given freely by a committed team of volunteers who clustered together around our mission from all over the country because we shared a common sense of purpose. And when we serve in accompaniment with others, that lessens our fear! I’ve always been unafraid to try new things. I’m convinced that when we are giving God our very best “Yes”, emulating Mary’s perfect fiat with our own (far less perfect) assent to his will, then our efforts will thrive if they are intended to. And if they don’t thrive, then perhaps our “failure” is meant to be a redirection of our mission. We’ve had plenty of missteps along the way—and I have personally as well—but I’m increasingly “fearless” in my desire to wake up every day and experience whatever it is that God has in store for me. To be honest, that fearlessness has taken me well beyond barriers I would have set myself and has enabled me to have life experiences I could never have dreamt possible. What advice or suggestions do you have for a woman looking to embrace this idea of asking Jesus what he wants from her and being brave? Let’s do proper, prayerful discernment, let’s pray for God’s will to be done in our lives, and let’s step out with the faith that if it’s meant to further Jesus’ teachings, our actions and decisions will be fulfilled in God’s perfect timing. Starting with CatholicMom.com and currently with your blog posts on LisaHendey.com you have written about current media, whether that be books, movies, or types of social media. You also speak to groups about new media. What made you want to share with others about your media experiences? I’ve been a “pioneer” of sorts in using technology to share the faith, simply because we started using Internet technology so early with CatholicMom.com. Despite my lack of a “tech” education, I’ve long been curious about these tools and how best to use them to answer Saint John Paul II’s invitation to the “New Evangelization”. Certainly, there are so many tremendous ways to grow in our own knowledge, connectedness, and service to others. Why not try them all, especially if in doing this we heighten our opportunity to encounter others who may not know of our need reminding about the Good News of the gospel? Nowadays, my physical proximity to Hollywood has me entering an interesting new mission territory as I frequently receive invitations to cover the latest movies being released. It’s very interesting to attend movie “junkets” filled with stars and film production personal and to seek out and share the faith angles in movies. Jesus often used parables—interesting stories—to teach his lessons. It’s fun and exciting to find these in modern day movies. I’m also often delighted by the opportunity to gently witness to folks in the entertainment industry and to hear what they have to share about their faith lives as well. I’ve learned to not be “star struck”, and to instead simply see the person in front of me—another Child of God just like me—and to hear how the work they do can often change our world for the better. Do you think we can “be brave” with social media in our everyday lives? I think we need to realize that in social media, for many of our “friends” or online connections, we may often be the only Catholic they will ever encounter. So, when we speak, it is for them as if the Church is speaking. This is a weighty responsibility, and one we should take seriously. But when we “speak the truth with love”, we can and do make a difference in people’s lives. Social media allows us to “accompany” in a way that our Church teaches is truly the witness folks often need in their faith journeys. But we have to do this with charity, with patience, with good discernment, with responsibility and with kindness. And we need to not be afraid to use these tools… the scary ones like Facebook live and Instagram stories and YouTube…to give an authentic portrayal of what it looks like to walk with Jesus. Saints have obviously played a big part in your faith. In particular, your children’s books the Chime Travelers and A Book of Saints for Catholic Moms, certainly reflect that. Do you have a favorite saint and why? I have a cavalcade of favorite saints, but my top two are Saint Patrick and Saint Therese of Lisieux. Had I been born a boy, I was to have been named “Patrick” after my Daddy and my beloved paternal grandmother Patty, two of my life’s greatest spiritual influences. I admire the fact that Saint Patrick was an imperfect missionary, but one who intentionally chose to be courageous and merciful in his witness in a land that greatly needed to know God’s love. Saint Therese’s “Little Way” has long given me hope that my tiny little acts, when performed with great love, can be my path to salvation. 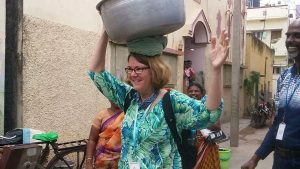 Her great desire to be a missionary despite her being cloistered is to me a terrific encouragement for those of us whose mission territory is often the minivan, the suburban soccer field, or the four walls of our homes. Thank you, Lisa, for taking the time to share with us. Again, we are so excited that you are joining us as a speaker this February 17 at the Columbus Catholic Women’s Conference! 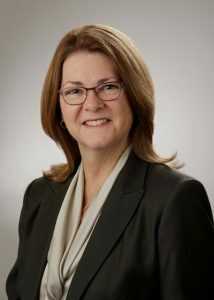 Lisa M. Hendey is the founder and editor of CatholicMom.com and the bestselling author of the Chime Travelers children’s fiction series, The Grace of Yes, The Handbook for Catholic Moms and A Book of Saints for Catholic Moms. She has produced and hosted multiple programs TV programs, including Catholic Mom TV and Making the Grade, a program aimed at promoting quality Catholic education. She has appeared on EWTN, CNN, CatholicTV and as a part of the Momnipotent DVD series. Lisa is also the technology contributor for EWTN’s SonRise Morning Show, a monthly correspondent on Relevant Radio’s Morning Air Show and a monthly correspondent on Holy Spirit Radio’s Spirit in the Morning show. She has blogged at Patheos, New Evangelizers, Integrated Catholic Life, CatholicTourist.com, and Productivity At Home. Her articles have appeared in Catholic Digest, National Catholic Register, and Our Sunday Visitor. Lisa has traveled internationally giving workshops on faith, family, and Catholic new media topics. She was selected as an Elizabeth Egan Journalism Fellow and traveled with Catholic Relief Services in Rwanda to study and write on the aftereffects of the Rwandan genocide on the eve of its twentieth anniversary. Lisa was selected to attend the first-ever Vatican Bloggers Meeting, the “Bishops and Bloggers” meeting and the Catholic Press Association tour of Israel as a guest of the Israeli Ministry of Tourism. Lisa has traveled and shared her writing from Tanzania, Colombia, the Philippines and India in service of non-profit organizations.